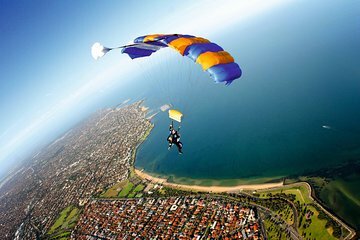 Libérez votre casse-cou intérieur en prenant votre envol pour le seul saut en parachute sur la plage de Melbourne! Découvrez le frisson effréné d’une chute libre de 60 secondes en sautant à partir de 4 300 mètres, puis revenez sur terre en parachute. Ce n’est pas seulement la montée d’adrénaline qui vous laissera reprendre votre souffle, vous profiterez également d’une vue spectaculaire sur Melbourne, St Kilda et la baie de Port Phillip. Plus important encore: votre saut en parachute en tandem sera accompagné par un pilote professionnel à tout moment, vous assurant un maximum de plaisir avec un minimum de risques! Vivez une expérience unique avec le seul saut en parachute sur la plage de Melbourne! This review ISN'T for MELBOURNE, it's for Sydney since the weather was bad two days in Melbourne and I couldn't jump there. But, instead had to jump in Sydney. 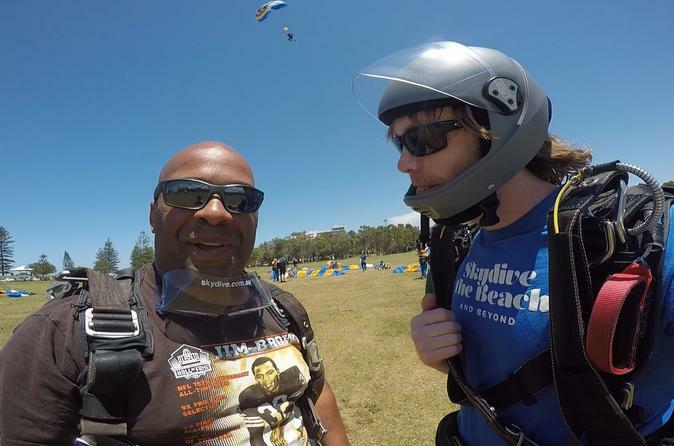 Wow, what an event and fun time skydiving for the first time in my life doing a tandem jump with Andrew W form the Sydney branch, same company though! I show friends and family my video and pics and they totally cant believe I made the jump. Man it's nothing like coming out that door looking out from that high up and seeing the land, the cold air, the wind and you know it's for real and jump time-lol! Everyone at Skydive Australia in Sydney were great, very friendly, professional and a great experience that will live with me for life! I loved the video and pics I bought were incredible something I look at daily at some point. I've been wanting to skydive almost two years now and it happened and it was a blast! You would be amazed how many folks on Nov 24th were on the bus paying to jump out a plane, the bus was packed-lol! Thanks Skydive Australia and Andrew W!!!! Had an amazing time, instructors were experienced and friendly. Do note that photos and videos will cost additional and I recommend getting it. I went during winter and it was freezing cold. Go skydiving during the summer instead in the early morning. MUST DO!! STAFF AT SKYDIVE AUSTRALIA ARE FUN, AMAZING AND HIGHLY TRAINED!! !